These two baby products (that are for DAILY use) contain a handful of ingredients that are not safe for adults, let alone children (hormone disruptors being the most questionable ingredients). But there was no warning to consult a pediatrician before use! Hmmm….. 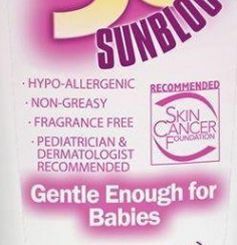 While I appreciate the FDA’s concern over baby sunscreens, I know there are some, that are much healthier than the products that the hospitals send young mothers home with as freebies! Visit EWG’s Skindeep Database (EWG is a nonprofit Environmental Working Group independently testing product safety) to check your product’s ingredients safety and find best options for yourself and your baby. 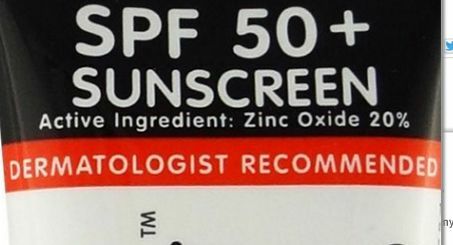 There are lots of options and an organic sunscreen doesn’t always mean zinc-white skin or super thick formula. You will be pleasantly surprised! If you do use a small amount of sunscreen on your baby, don’t assume the child is well protected. Avoid combination sunscreens containing insect repellants like DEET. Young children may lick their hands or put them in their mouths. According to the AAP, DEET should not be used on infants less than 2 months old.